Gravity Puzzles are not a recent invention. 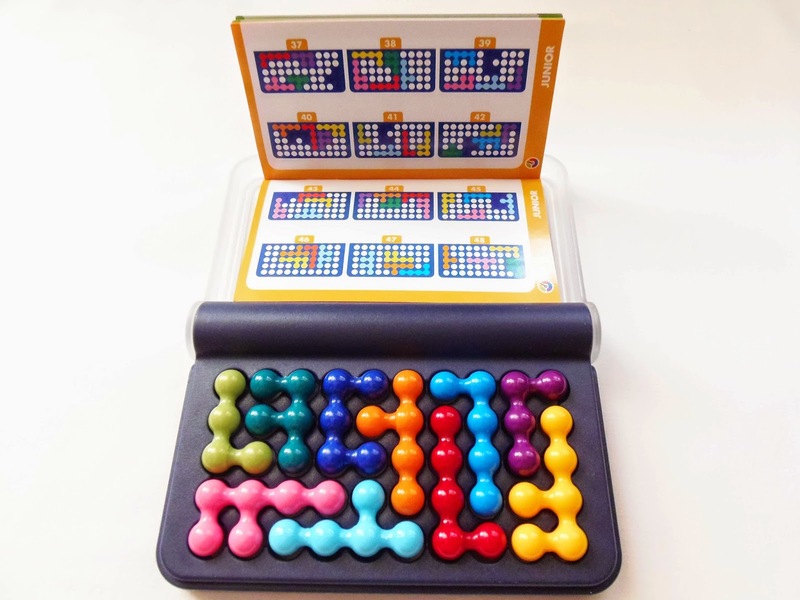 In fact, one of the first puzzles in this category, the Bloxbox, appeared in 1972 and was invented by Piet Hein, the inventor of the Soma Cube. 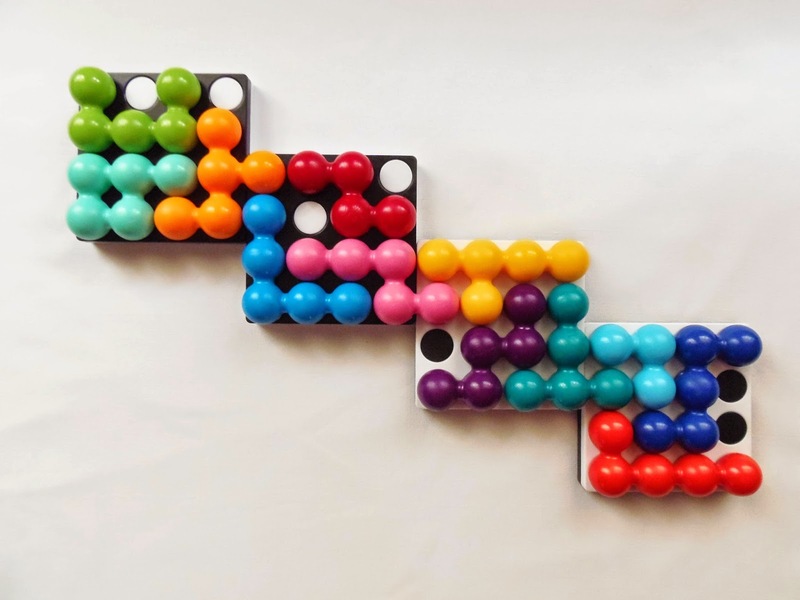 Equal7 was designed by Vladimir Krasnoukhov in 2012 - notice that I'm not saying "invented" because this concept already existed - and it gives a new twist to the sliding blocks/gravity puzzles by adding a much more difficult challenge. Equal7 is to a regular gravity puzzle what a Rubik's Cube 5x5x5 is to a Rubik's Cube 3x3x3. That's a simple analogy to make you see how difficult and more demanding the Equal7 puzzle really is. There are many different challenges, but fear not, as there are easy levels, as well as medium and hard ones. Are you good at addition? 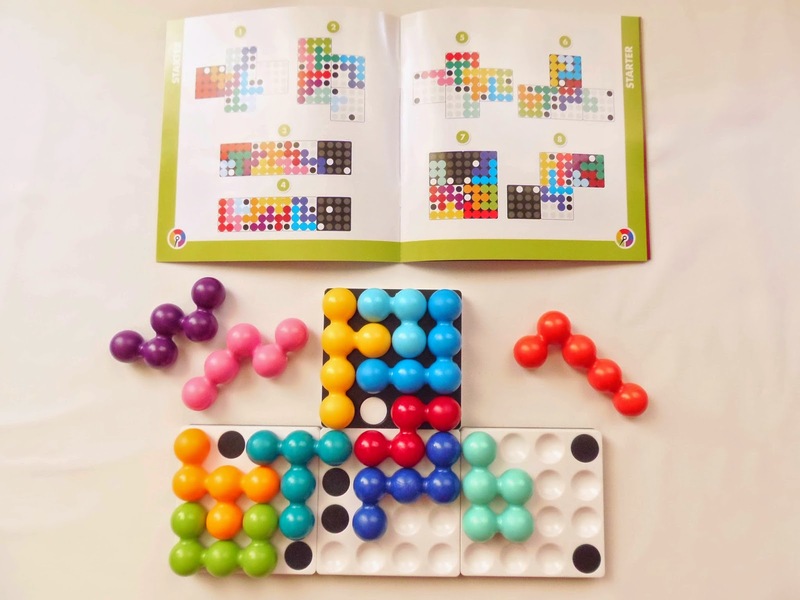 The Equal7 puzzle is a cube measuring about 5cm in diameter. Inside it are seven special dice, with each face marked with one to five dots - the face where six dots should've been is just blank. 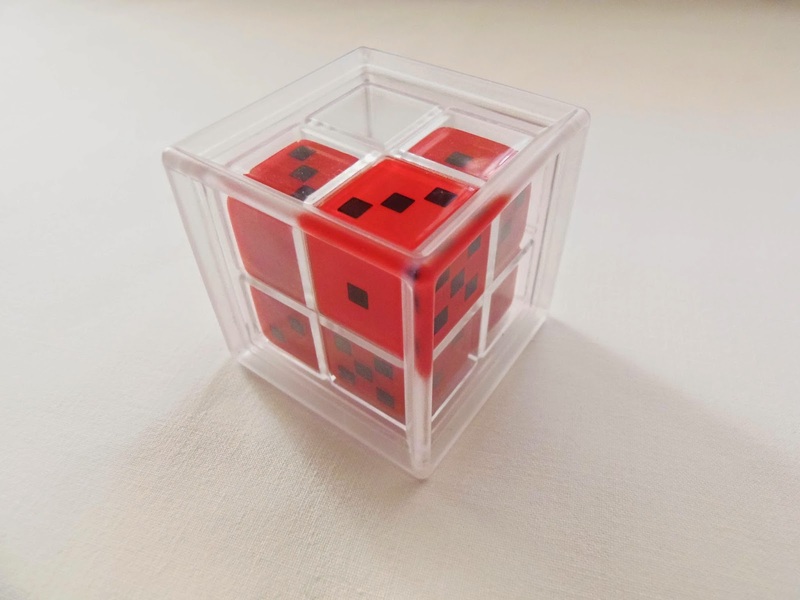 The empty space allows for the dice to slide and move across the cube by tilting it, creating a dynamic environment where each face of the cube is always changing with each move you make. The idea is to get the same number of dots on all six faces of the cube at the same time. As mentioned above there are different challenges, each one asking you to get all faces of the cube with a different number of dots. The easiest difficult level is to get all six faces of the cube with exactly 10 dots. Level 2 requires you to have all faces with 11 dots. Level 3 with 12 dots. And finally, the hardest level is for you to get exactly 7 dots on each face of the cube. Doesn't seem logic, having the hardest level with the fewer number of dots, but believe me, it's very difficult. The cube has a special feature which allows the proposed challenges to be a little "different" - not sure if I should classify them as easier or harder. 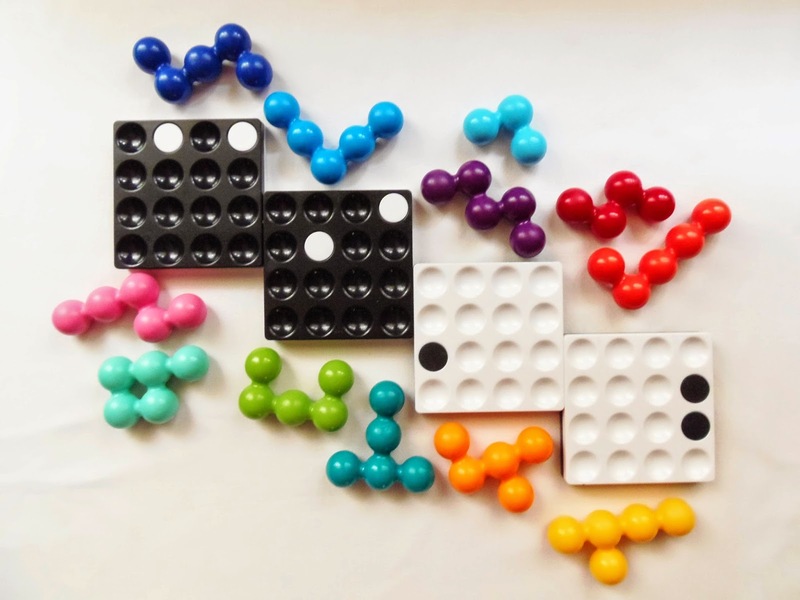 Since each of the cubes' faces can be divided in four, which carry four dice, there are three faces of the cube where the space of a die is already painted with a specified number of dots. Any die can be placed behind this space, but it will not be visible. Since the total of dots in that space is already pre-determined, you can anticipate which dice should be used for the other three spaces. Adding this constraint can be viewed as making the puzzle both easier or harder, depending on your interpretation of the puzzle's concept. On one hand, you don't need to worry about that space, since any die can be placed behind it, but on the other hand, it restricts the number of possibilities, thus making it harder getting the right die for the other three spaces. Whichever your interpretation, though, one thing is certain... Equal7 is a great puzzle, capable of challenging even the sharpest minds. 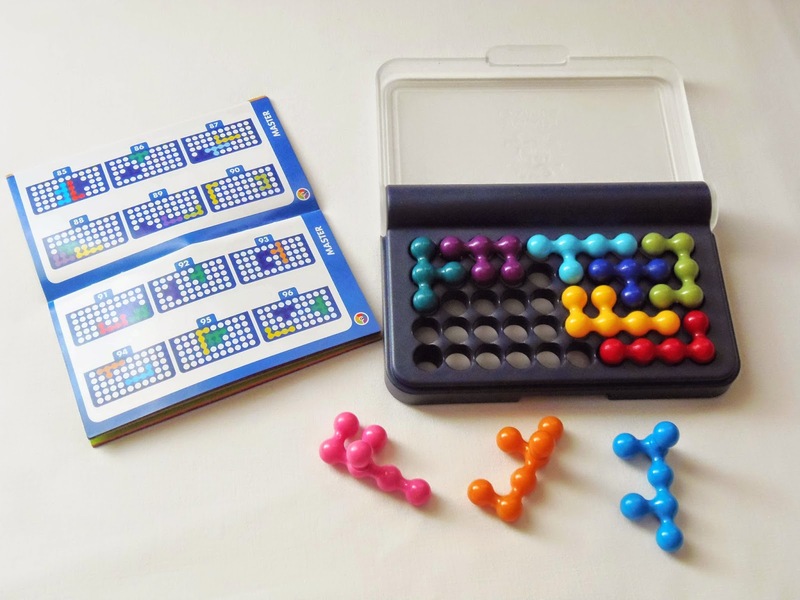 Equal7 by Recent Toys isn't a puzzle for mathematicians only, and even though it seems intimidating, it can be extremely fun to play with. 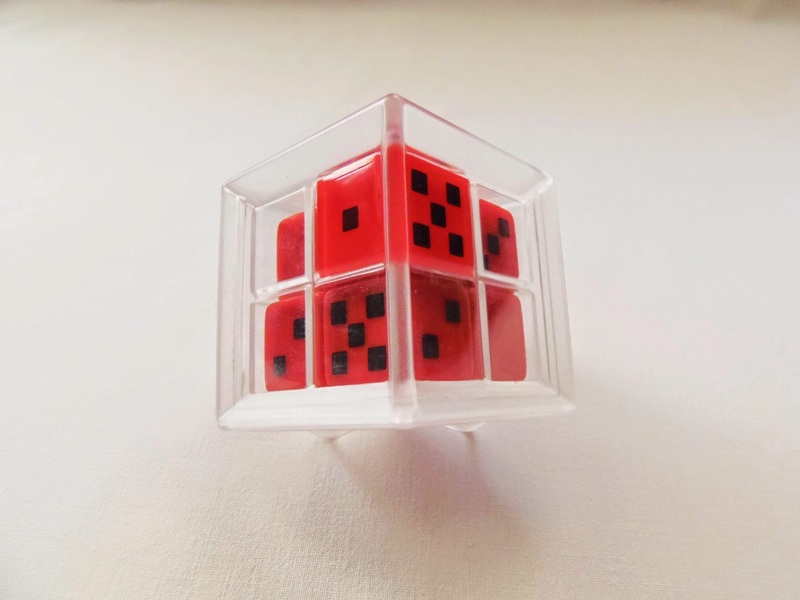 The movement of the dice sliding inside the cube is very smooth and satisfying. 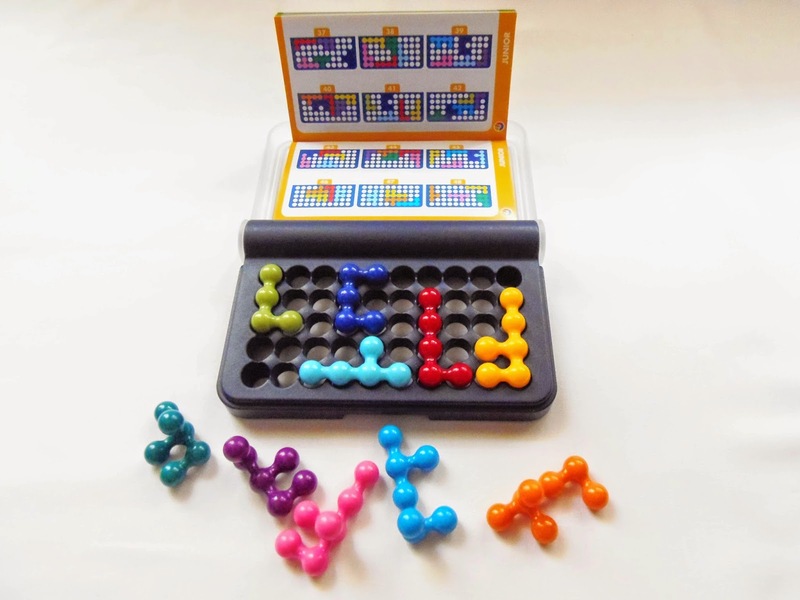 The different levels of difficulty allows for everyone to try it, even a beginner. 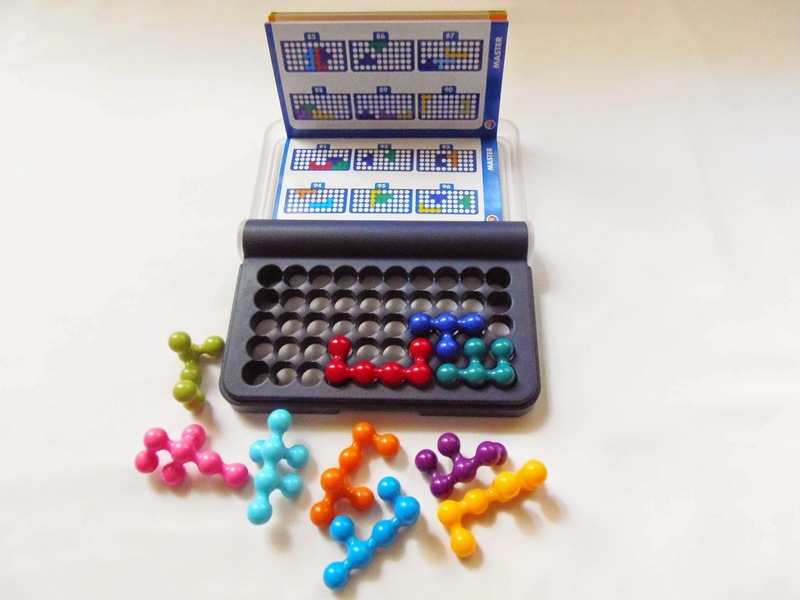 Availability: The Equal7 is available to purchase at PuzzlesdeIngenio.com for €11.50. If there's one thing that truly defines exquisite Japanese craftsmanship, Japanese Puzzle Boxes must be a good candidate for such a recognition. These delicate works of art have been fascinating puzzle enthusiasts all over the world for the last few centuries, and with hundreds of different designs available in all kinds of shapes and sizes, it's easy to feel overwhelmed by the sheer variety, especially when you're starting your collection. Yes, once you get one, it's almost impossible to settle for just the one and you'll almost immediately start pondering about the next acquisitions. 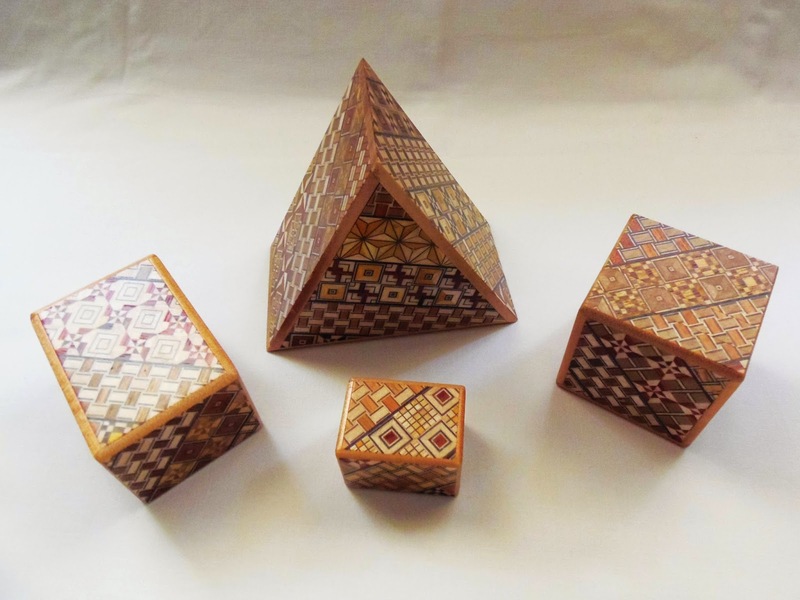 With this one, I have now four Japanese Puzzle Boxes, as you can see below, and the triangle one is the largest so far. Japanese Puzzle Boxes usually have a distinct way to be named: a few words are used to describe the characteristics of every specific box. Since the majority of puzzle boxes have a rectangular appearance they usually don't use any words to describe that characteristic. However, when they move away from the usual shape, they have to describe it - In this case, the name starts with "Triangle". Next, there's a number, which always indicate the minimum number of steps required to open the box. 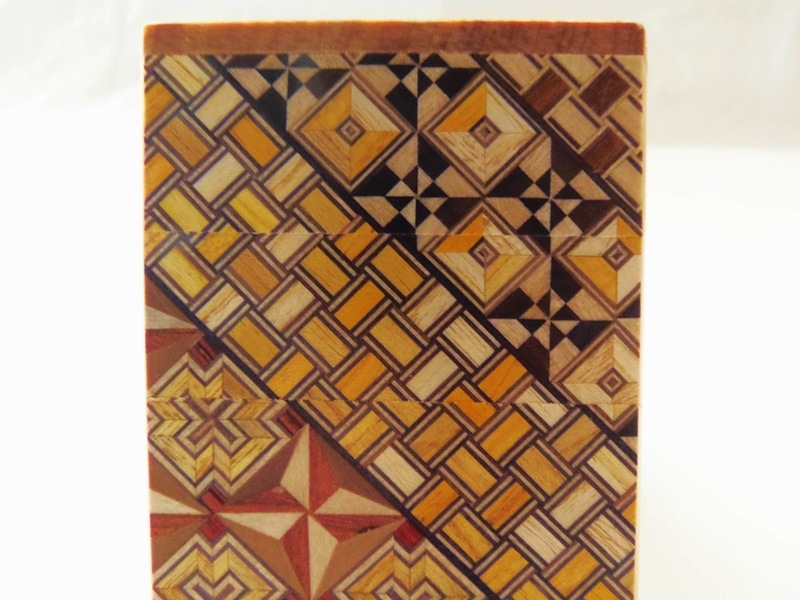 And the last word, describes the pattern used in inlay work for that box - Here, the pattern is Yosegi. Usually, there's also a number accompanied by the word "sun" or "mame". This indicates the size of the box. 1sun = 3cm and 1mame = 1sun. The triangle one doesn't have this particular description, because it's a special shape, measuring about 11.5cm (4.5") in diameter - Just shy of 4sun. One thing that I found common among most Japanese Puzzle Boxes is that they're usually pretty easy to solve. Even if you have a 50+ step box, they usually require a straightforward sequence of back and forth similar movements. 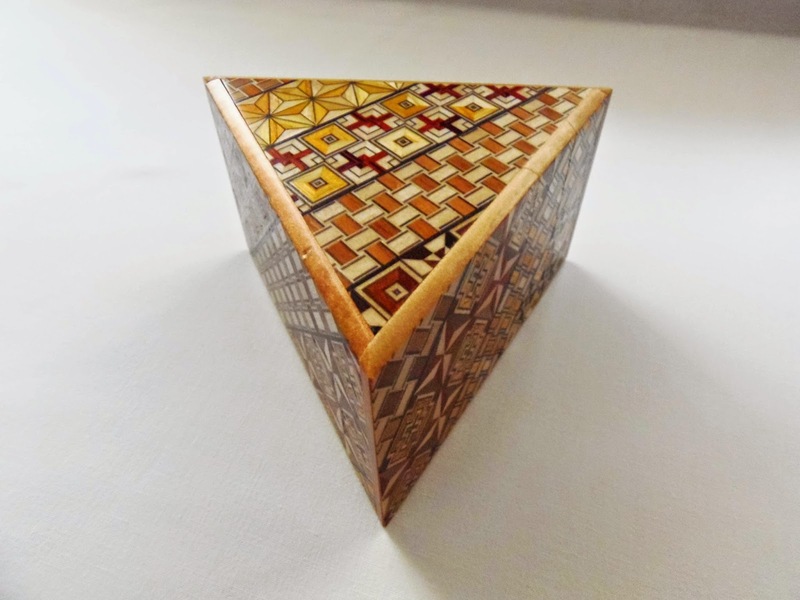 This is not necessarily a bad thing, depending on your point of view, but what I think is: if you like, or collect, Japanese Puzzle Boxes, their difficulty level must be among the least important factors for choosing them. Having said that, I do wish they were a bit more challenging, but it's not a deal breaker for me. I just love their gorgeous designs and intricate patterns. If I were to collect difficult puzzle only, I probably wouldn't have half the puzzles I currently own. 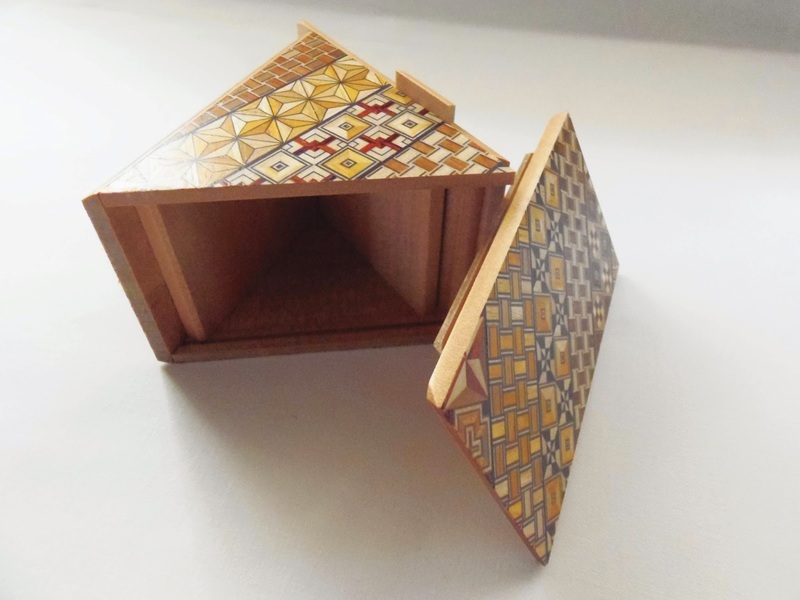 Another subtle detail I noticed on my Japanese Puzzle Boxes is that their sliding panels can be quite easily spotted, as the pattern is slightly misaligned with the rest of the box. Now, I don't understand much about crafting, but would that be so difficult to achieve, having to perfectly align the sliding panels with the rest of the box pattern? This is not an isolated mishap, because I see this in all my four boxes, so I believe it's fair to assume it's a general thing common to all Japanese Puzzle Boxes. Now, focusing more on the Triangle box itself. It's a 7-step, so a total of seven steps are required to fully open the box. As mentioned above, I didn't have to search that much to find the first sliding panel, since it's fairly easy to see the misalignment in the pattern. Finding the next steps weren't so obvious, but I managed to open it within five minutes. It's always a pleasure to see the box opened, though, no matter how easy it is to solve. There's a space inside large enough to conceal a peace of jewelry or something similarly sized, and because it's not very difficult to open, it could be used as the perfect gift-box - No wrapping necessary, since the pretty pattern already does that job. There's a lot of different puzzle boxes out there, but Japanese Puzzle Boxes are a whole different breed. Their unmistakable and mesmerizing patterns invoke special feelings among collectors that are difficult to explain, but I'm sure you'll understand them once you own one - Be warned, though. You won't be satisfied with only one. 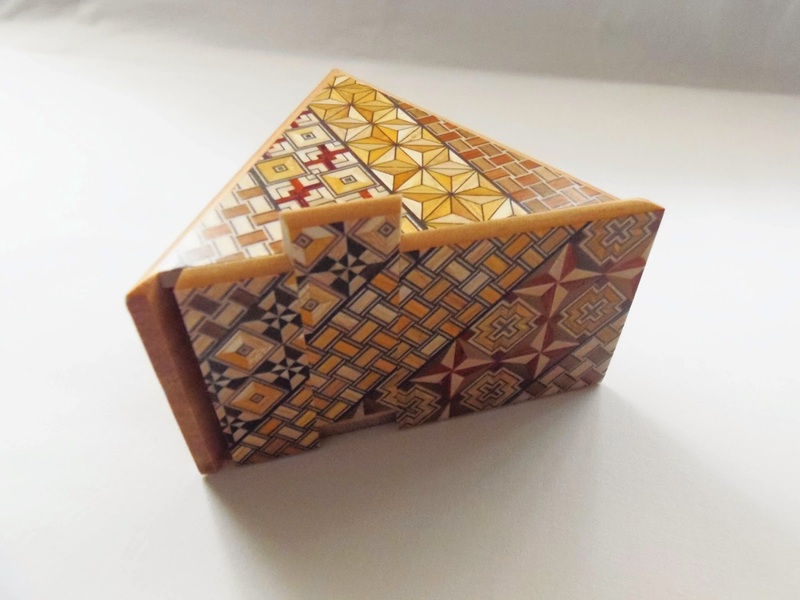 Availability: You can get the Triangle Japanese Puzzle Box at PuzzleMaster. If you want to check out other designs by these talented Japanese designers, click here. Over the years, I've come to associate coin puzzles with Robrecht Louage. No wonder, as every year Robrecht participates in the International Puzzle Party and enters one or two new designs featuring coins trapped in mazes. 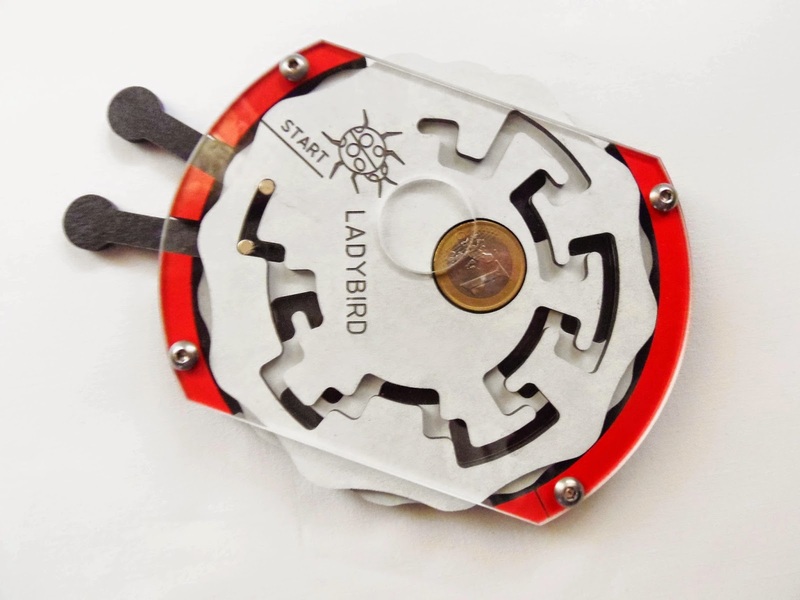 This year, at the 34th IPP, and with the collaboration of Michel van Ipenburg, the Ladybird was added as the newest member of the coin puzzles' family...And what a member! This is why I love Robrecht's puzzles so much. When I think he can't do better than last time, he outdoes himself time and again. It's difficult to choose one single puzzle as his absolute best, but at least Ladybird is up there as one of the best. Why? First, the design. You can't have a great puzzle without a proper and original design. Then, there's the actual puzzle itself. If it's too difficult, it may frustrate most people and they might give up on it. But, on the other hand, if it's too easy, people don't feel challenged enough or they don't feel they've accomplished anything. You gotta find the perfect balance. Speaking of design, the Ladybird is a great achievement in this department. Again, one of the best by Robrecht. 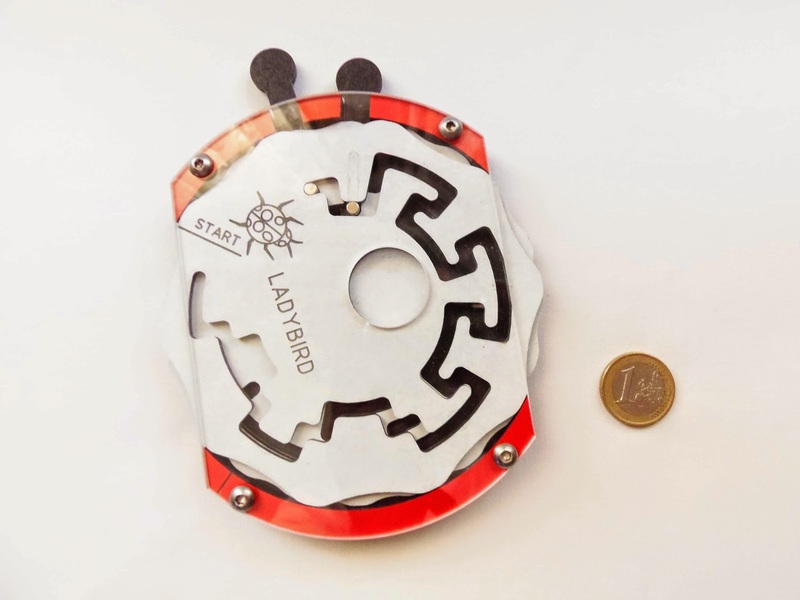 Also, this is one of the biggest, if not THE biggest coin puzzle yet, with measurements of 13.2cm x 11.5cm (5.2" x 4.5") (without the antennae). The materials are pretty much the same as its predecessors, the main material being trespa, with a protective acrylic panel. 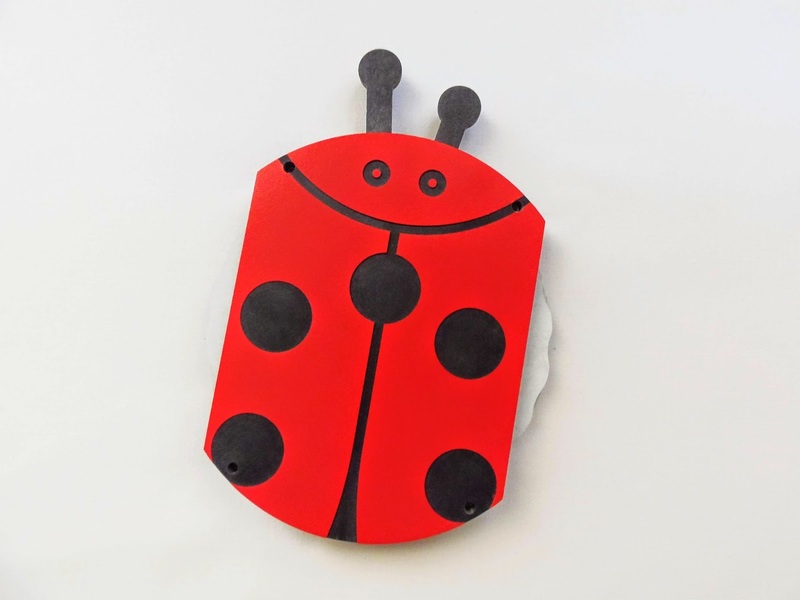 Unlike previous coin puzzles, the back of the Ladybird puzzle was also decorated with the bug's red and black motif, for a truer large scale representation. As for the puzzle aspect, two similar rotating mazes in two layers make this a very fun challenge to play with. There's a 1€ coin in the top layer that needs to be aligned with the hole in the acrylic in order to remove it. For that, you need to rotate each maze, independently, while pushing or pulling on the two antennae so you can navigate both mazes back and forth. Since each maze is slightly different from one another, you have to be constantly moving them so the two paths align with each other and thus, creating a path to free the coin. This one took me a while to solve, and it's one of those puzzles that makes you think you're very close to the end, but blocks your very last couple of steps. There's a total of 160 moves necessary to solve the Ladybird, although I reckon it took me a bit more to reach my goal, and only after 20 minutes or so. Returning to the start position is a lot easier, though, so you can easily start from the beginning and try to solve it quicker the next time around. 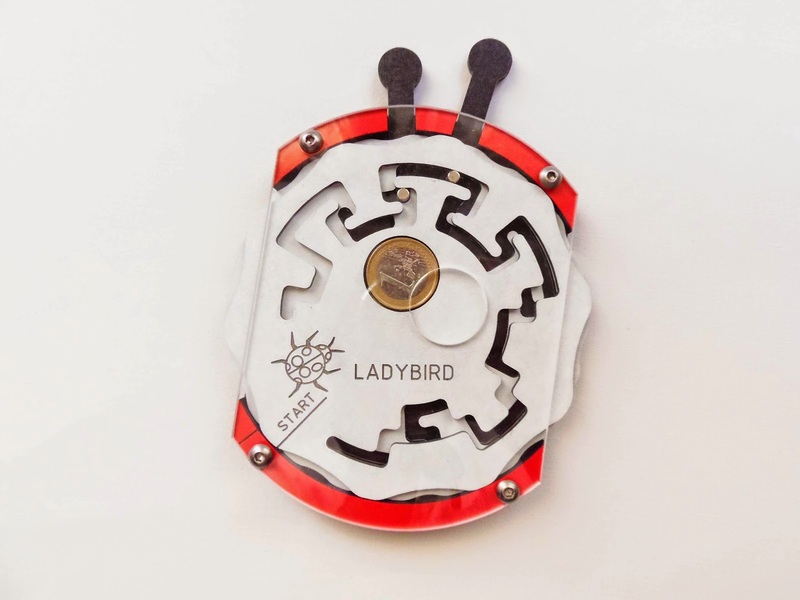 Robrecht Louage's Ladybird is an incredible puzzle. It nails almost every requirement of what makes a great puzzle without compromising functionality. The mechanism is simple, but works flawlessly, and being a classic maze without a complex concept, it's a nice puzzle for anyone to try. Availability: You can contact Robrecht directly at «rlouage(at)telenet(dot)be» to ask for a copy of Ladybird or any other of his original designs. Packing Puzzle fans rejoice! 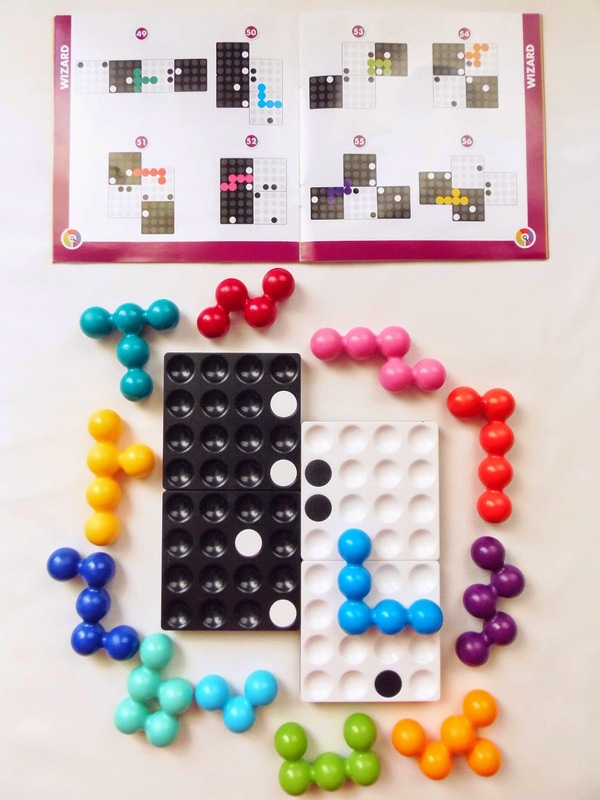 Meet Quadrillion, a wonderful new puzzle game for one player, from the genius mind of Raf Peeters from SmartGames, which might be the best packing puzzle I've ever tried. With millions of challenges available and a stunning presentation to go with it, Quadrillion is the ultimate game for a bored puzzle fan. The premise of the Quadrillion game is quite ambitious, to say the least. Four magnetic grids that snap together in countless different ways can provide you with a whopping 4+ million DIY challenges to solve - That's enough challenges to last about 7 and a half years while doing one challenge per minute. It hurts your brain even just by thinking about it. With all these incredible facts, it's easy to understand why this game is so fascinating. Each of the four grids has a diameter of 4x4 units. They can be arranged in any way, as long as they are joined side by side at half their diameter or at the same height. This is due to the magnets inside the grids that only snap at those positions. When you have your desired configuration, all you have to do is to fit the 12 pieces on the board. Most of the pieces are pentominoes (5 units), but there's a piece with four units and another with only three units. There are a few obstacles that will make your task a bit more difficult, though. Each grid has one or two (black or white) dots on either side that cover the empty spaces. You cannot put any piece on top of these dots, but all the remaining empty spaces need to be occupied by puzzle pieces. Also, any given piece can occupy empty spaces on multiple grids. In other words, you don't need to place a piece exclusively within the limits of one grid - Think of any board as a unique frame without inside edges. Just an exterior contour to define its shape. The pieces of the Quadrillion game are what makes it visually so appealing. Each of the 12 pieces have a distinct color, and their round shapes are easy to handle. They're also rather big and made from strong and durable plastic, almost indestructible. When you solve any of the countless challenges, the colorful effect is quite beautiful. 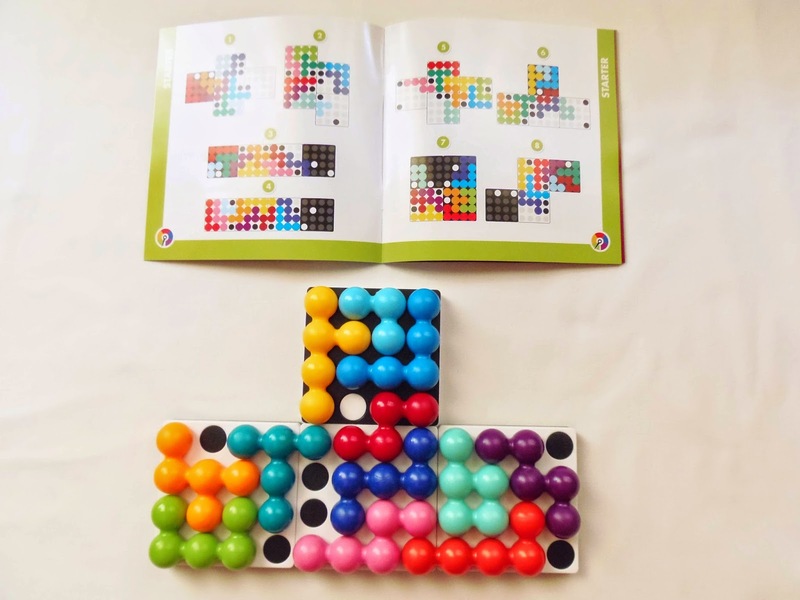 If millions of challenges weren't enough for you already, included with the game is a booklet with 60 challenges divided in five difficulty levels, to get you started. When you manage to master all of these, you can create your own challenges, since there's still over 3999940 available challenges. The difficulty ranges from easy (Starter) to extremely difficult (Wizard). 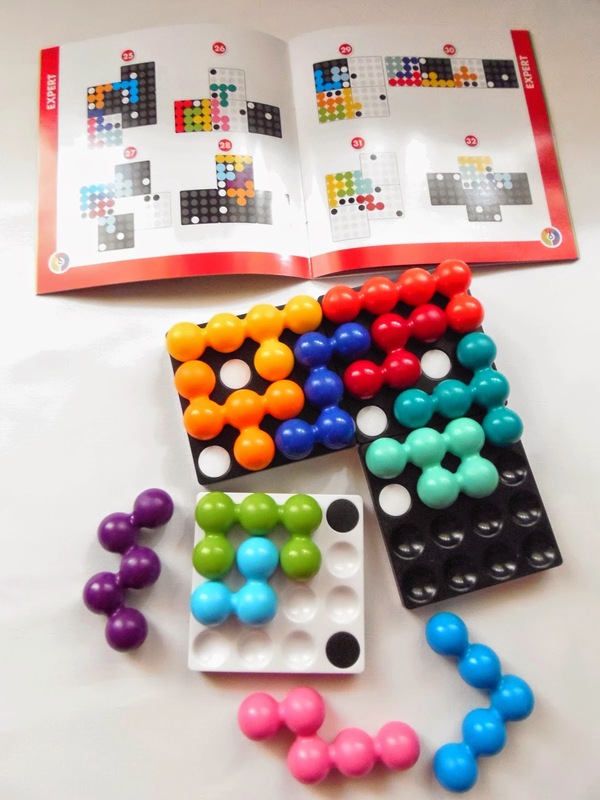 The first challenges have most of the pieces already in place at the board, but the harder ones have only one and even zero pieces, so you have to figure out where each piece goes. Also, an interesting fact to take into account: every single one of the 4+ million challenges have at least one possible solution, and many of them, the custom (DIY) challenges can reach thousands of solutions. 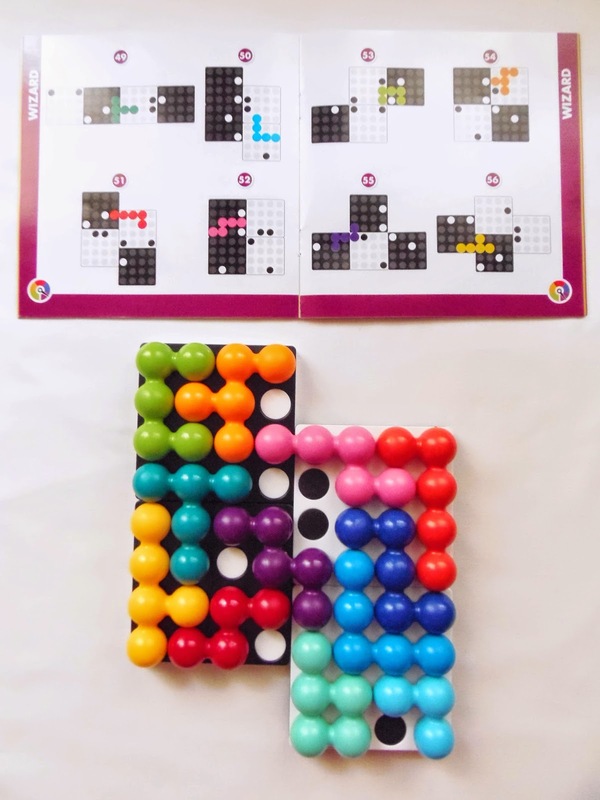 The ones included in the challenge booklet, however, have only one solution each. Availability: You can get a copy of Quadrillion or any other SmartGames product at PuzzleMaster. Picture Frame Puzzles are among my favorite type of Packing Puzzles. Yes, most of them are quite difficult to solve, but they're also the type of puzzle that gives a lot of room for creativity. You can do just about anything with a laser cutter and any theme will make a perfect Picture Frame Puzzle. 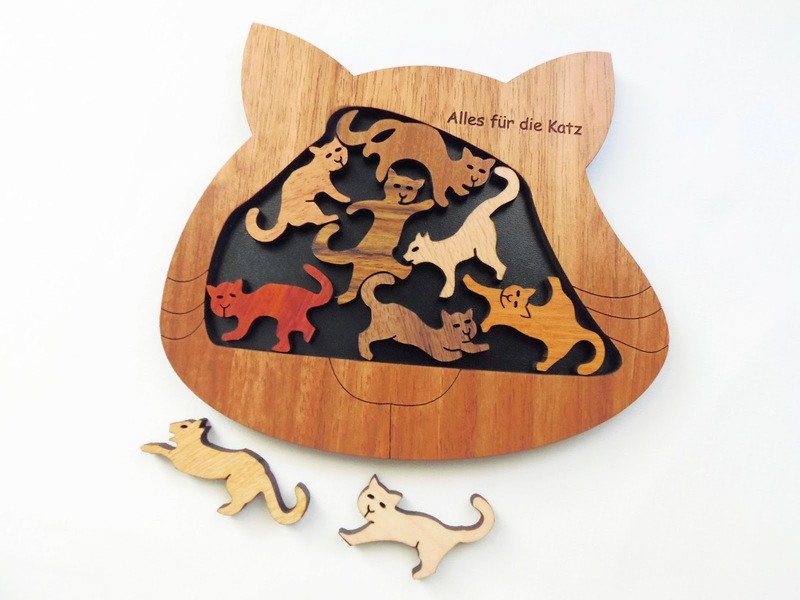 Jean Claude Constantin, once again, does not disappoint and gives us, cat lovers, a stunning puzzle with nine of these lovely felines in all sorts of cute positions, the "Alles Für Die Katz", which literally means "Everything for the Cats". Can you put a stop to the chaos and rearrange all of the cats in the frame? The design, starting by the frame itself, is in the shape of a cat's head. The contours of the frame are irregular, which makes it even more challenging, and the area is just enough to pack all nine cats inside with almost no wiggle room left. 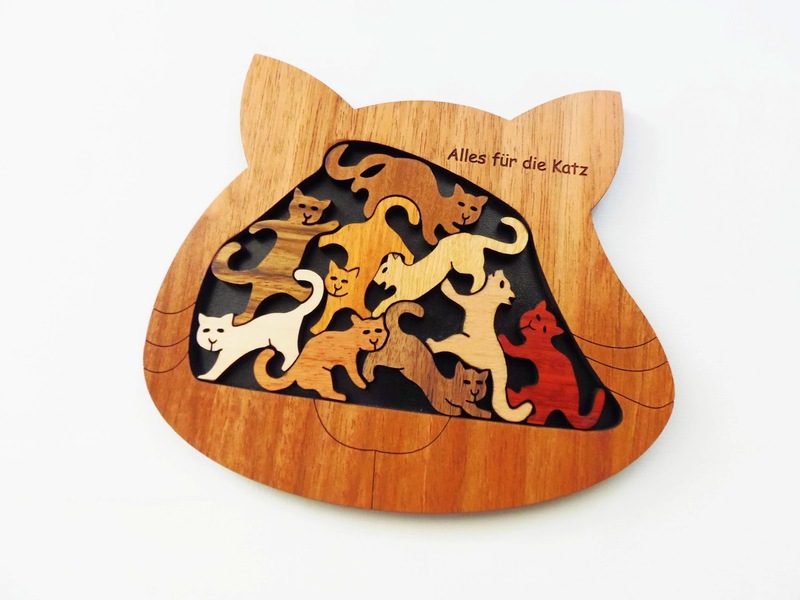 Each cat shape is made from a different kind of wood, so the end result is a colorful mix of cat breeds that just stands out from many other wooden puzzles. The size is a little small for a Picture Frame Puzzle standard, about 16cm x 13.8cm (6.3" x 5.4"), but still big enough to comfortably play with it. Like every Picture Frame Puzzle, there's all sorts of subtleties in the design of each piece that should get the most out of the little space you have in the frame, by joining the pieces at specific positions. These little tricks are what makes Picture Frame Puzzles so fascinating. It's the way the pieces seamlessly fit with one another - Like a perfect harmony between design and functionality, that so few craftsmen can achieve. What do you get from this fine art? A gorgeous puzzle, but also a devilishly difficult one. If you know someone that loves cats, you can't go wrong with this puzzle as a present. It's a wonderful puzzle, although extremely challenging, but a perfect center piece in any coffee table or desk...or collection. 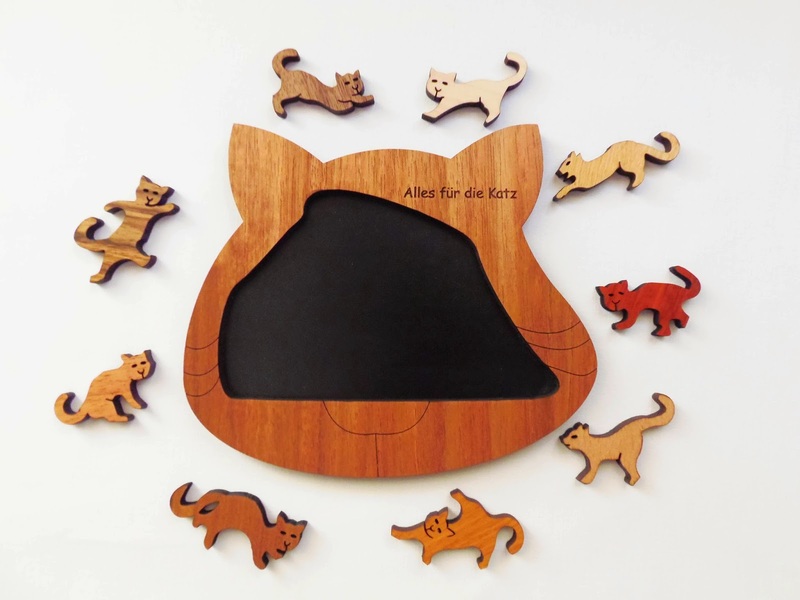 Availability: Alles Für Die Katz can be found at Brilliant Puzzles for $25.95. 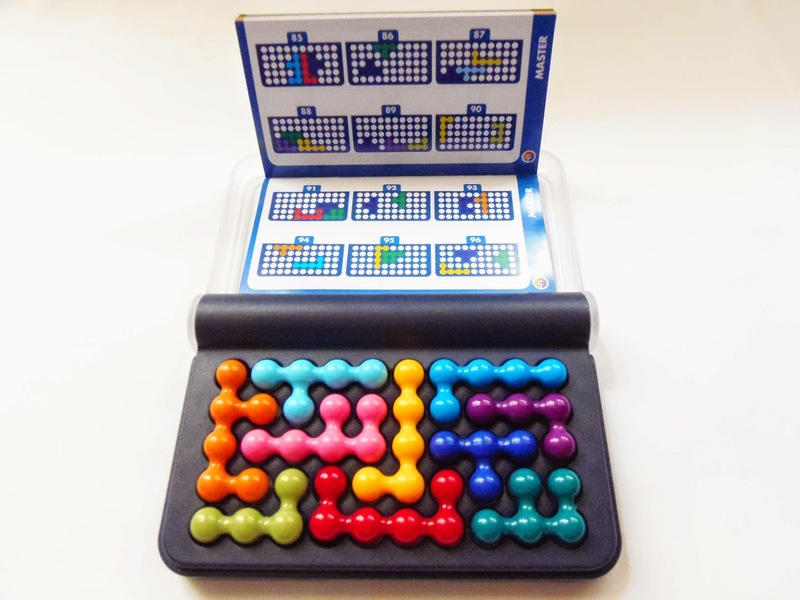 If you fancy Constantin's puzzles, you can check out other designs by him here.